Many myths surround Prophet Temitope Joshua, the youthful General Overseer of The Synagogue, Church Of All Nations. When cynics are not raising questions about his source of supernatural powers, they are perpetually wondering what manner of man is he. Yet, the more people seek to unravel or spin stories about this enigma, the more confused they get. But apart from the astounding miracles that unfurl in the church every day, critics also never cease wondering if the man actually has any marital life. A bevy of ladies, very beautiful ladies, strut elegantly into the penthouse presidential suite at The Synagogue Church of All Nation s where The Spectator team is patiently waiting, and watching videos of some of the explosive miracles the church has witnessed in recent times. At this hour, the team is watching the video of the special thanksgiving service held for the brand new Ghanaian President, Professor John Atta Mills, on his recent ascendancy to power. When the door closes behind the ladies, the first thing you notice about Evelyn, the delectable wife of Prophet TB Joshua, the General Overseer of The Synagogue, Church Of All Nations, is her infectious radiance and unmistakable enthusiasm. Both attributes, even more, make her the most powerful, yet most adorable woman in the spiritual empire that her husband has built. An empire which presidents, kings and queens, princes and princesses, and assorted dignitaries from across the globe, routinely throng for their diverse spiritual needs. With that, she signals us to begin to fire our question. In one hour, the session is over. The product of that encounter is the stuff this superlative exclusive is made. Please, enjoy the interview, the first she has ever granted any Nigerian newspaper. And we are not blowing our trumpet. Your husband made a promise about nine months ago that The Spectator would be the first Nigerian newspaper you would talk to. After waiting for so long, we thought it was never going to happen. But it is happening now. So, let's start by asking you, how does it feel to be Mrs Evelyn TB Joshua? I count myself very lucky among women. My husband is a man every woman will want to have as a husband. That presupposes a serious contest over him (general laughter…). Seriously speaking, do you fight any battle to keep him? Not at all. I know that every woman will desire to have him as a husband, but there are not struggles on my part to keep him. Prophet Joshua is very handsome and a great instrument in the hands of God, sought after, all over the world, by presidents and kings. You mean there are no special battles you fight to gain his attention and also keep him from prying female eyes? Not at all. But I know that when a man is hardworking and God-fearing, every woman will like to have him. But believe me, I fight no special battles to keep him. He knows who he believes and God whom he believe and serves so well is capable of keeping him, and has, indeed, been keeping him. So, how do you cope with his tight schedule? This is somebody who spends every minute of his life in the church ministering to people's needs and all that; and we do know that women need their husbands as much as their husbands need them. We are into the same cause. So, I don't have any difficulties handling that aspect at all because we are pursuing the same goal. God has so made it that we complement each other perfectly well in very many ways. Are you a pastor, too? No, but I am helping. So, you never trained as a pastor? We are many here; we are under training. Yes, and it is a life-long training. It is a continuous, never-ending training like the school of life. Of course, as long as we are living, we will continue to strive in God's will. That was 20 years ago? Twenty years now, yes. I visited a sister somewhere at Ikotun-Egbe, and, then they were talking about a particular man, a prophet to be precise. It was a kind of meeting to be precise. And it's like everybody in that gathering, or at least half of the people in the room, had actually visited him. So, they were saying a lot of good things about him. I was thrilled. At the end of the whole thing, I called a sister outside and asked whether she could take me to the prophet. I didn't ask to go there out of curiosity. I actually needed a guide at that point in time. Were you at any crossroads at that point in time? Not really. I wasn't at any crossroads, but I desperately needed a guide. Or were there some challenges you were facing and for which you needed to see this man of God? Not quite so. But I had seen pastors. I worshipped in a church and I had read about prophets in the Bible, though I had never come across any. But at that particular time, I needed a guide, sort of. Yes, a spiritual guide. A counsellor. Could you tell us the church were you were worshipping before you suddenly and desperately needed this spiritual guide? I was in Assemblies of God Church. No, I was not. Can we go back to my story, please? So, the sister and I scheduled a date. We got to his place and he was not around. Not to The Synagogue, I believe? Okay, where was his house then? Down in Ikotun-Egbe, at Agodo. It was a mansion was it? (Laughs loudly…) Yes, by the grace of God, it was. If we may take you back, what things were people talking about that made you get interested in him? Many things. This one said he prayed for him and things became okay from there. Another said her life was at a bend but straightened up when she met him. You know, things like that. So, we went there. Unfortunately, we did not meet him at home. But looking back now, I thank God that we didn't meet him that day. Because that would have been the end of this story. Why would it have been the end of the story? It would have been because what he told me the very first day that I set my eyes on him, if the sister were there, I would have believed that maybe she had gone behind me to tell him all about me. And that would have ruined it. So, did the man of God tell you the story of his life? Without any pre-knowledge of who you were? Yes. Okay, I'm coming (laughs…). Some months after, I visited him. That was in 1990. I could remember that day was a public holiday. I remember also how I nearly lost my way because I had never been to the place before, except that day I went with the sister. That is to say, this time you went alone? Yes, I did. I went alone. But before I was able to locate the place, it was a bit difficult for me. When I got into the waiting room, I met two men waiting to see him. Before this time, the idea that I had about a prophet was that of an old man with a white, long beard and things like that. So, on that day, I was reading a novel that I came with when I suddenly saw someone come into the room, pick one or two things and went back. But the shadow of whatever I saw was not that of an old man. No, I didn't even look at his face. But when he left one, one of the two men was telling the other one, 'that's him. That's him.' I looked up but he had gone. They went into the consulting room before me. Finally, it was my turn, and I went in there. We sat opposite each other. And, he was gazing at me for about a minute and some seconds. I gazed at him, too. Transfixed as I was, I noticed that there was a piece of paper before him. Still looking at me, he wrote the word, 'Ejide', on it. (Transliterated, Eji de – twin has come). Lest I forget, I'm a twin. And before then, you had not told him anything about yourself? Just like that. It was strange, but that gives us an insight into what the Scripture says that the Spirit testifies with our spirit that we are God's children. I think that was it. That was how I met him. Some months later, I asked him why he thought it was right seeing a lady for the first time and going on to propose to her. He said he had seen me four days before that very day. Or was it a revelation? Okay, let's go back to the time you entered his consulting room. You said you sat opposite him and looking at each other intensely, I believe. At that particular moment, what was going on in your mind? A lot of things. In the first place, I was expecting to see an elderly man. But instead you saw a dashing, handsome, young man? (Laughs). Oh yes! That was it. (Laughs again…) I wouldn't know. But like I told you, he wrote my name on the piece of paper before him. That was the first thing that really shocked me. And the fact that he proposed to me the first time that we met without waiting to know some things about me. Wait a minute. Don't you think that one of your friends could have had contact with him and told him about you? Unfortunately, I don't have friends. As I told you, it was a sister that I visited who took me there in the first place. So, there is no way anybody could have gone to tell him about me. And, when I was going there the second time, she wasn't there. I went alone. Why did you choose to leave where you were worshipping? I've told you how I got to know about him. I told you too, that I didn't go there out of curiosity. I needed a guide, whom, I believe, I could get from the prophet. That's why I went. In what area of your life did you need a guide before you went to him? Was it on marriage, business etc.? What area? You know, life is full of challenges. As a young lady, I knew God was there. I have a Creator and I know He can guide me into the right path. So, I wouldn't say business or marriage drove me to him. I just needed someone to guide me into the right path in life. What were you doing in the secular world before this time? Should I say as it was then, so it is now? After my secondary school education, at that time, you could get a job in a factory or whatever, hoping to be staffed one day. So after my secondary school education, life was like: today, you are in business; tomorrow, you are in a printing press, and so on. I think the last place I worked before I met him was in Nigerian Distilleries in Ota. What qualities eventually cemented the relationship between you and Prophet TB Joshua? As I told you, he is a very honest and humble man. Yes, he is a God fearing man too. I saw a kind-hearted man, a zealous man, a man of one purpose, a man with a sole aim: to please God at all times, with every other thing being secondary. I think those qualities were what cemented our relationship. Okay, how were you convinced that he was the man that you were going to spend the rest of your life with? When I woke up that very morning, I never knew. But something in me said: 'Go to the prophet.' And when he proposed to me, it was strange, but then, my heart agreed with it instantly. Did you say 'Yes' there and then? You can say that again. So, from there, one thing led to another and then your marriage or wedding. When did it take place? How many months or years of courtship did you have? I am not sure that we courted for long. The wedding took place the same year – 1990. Was it a church wedding or traditional wedding? Let's have you talk a little about yourself, when you were born and where, about your family and where you come from. I was born about 40 years ago into a family of seven. What's your position in the family? Fifth, my twin brother and I.
Twin brother? Where is he? There's no problem. I was born to the late Mr and Mrs Nicholas Akabude in the quiet town of Okala Okpuno in Oshimili North local government of Delta State. I started my primary education at St. Emecheta Primary School, Ezi Town, also in Delta State. Years later, I came to Lagos, that was in 1977, and completed my primary education here at Orile Primary School, Oshidi, and my secondary education also in Oshodi. That's all about my education. But a few years later, my husband sent me to Ghana and I was able to take some management courses there. So, in what practical ways has your ministry complemented your husband's? I know you are a minister in The Synagogue. What's your own ministry? Tell us about your ministry. It's the ministry of reconciliation. In all aspects – parents-children relationships, marriage and things like that. I think they go hand-in-hand with one another. You can't actually separate them. How does this ministry complement your husband's ministry, bearing in mind that he is into a prophetic and healing ministry? When we talk about reconciliation, you need a lot of time to listen to people, to hear them; they want to bare their minds and a prophet hasn't got that time, especially after talking for hours. But I do that. What are the peculiar challenges that face you as Mrs TB Joshua? Yes, are there challenges that you face? Life is all about challenges. All those problems and trials, I see them as challenges. No, no, no. What's he doing? Whatever it is, he has my support. You mean it doesn't affect the home in anyway? Okay, how come you have kept to yourself for so long, because if this is not your first interview with the press, you've granted very negligible few? Or is it that you dislike the press? Not really. You said very few, not that I have not granted any. You mean you have not come across any? I've not. I hope this will go very far so that someone else does not come to ask me, you've not granted any interview… (general laughter) Actually, like the Bible says, there is a time for everything, and God's time is the best. Maybe, the time is just ripe for what we are doing now. Where God guides, He provides. And those whom God has called for any service, He makes them fit for it. So, there is not much problem about that at all. People believe that there are a lot of myths surrounding your husband. I've been his friend since 1989. I've heard people say a lot about him. I've seen people publish a lot of things about him, and they are still publishing. When you read or hear things that are not palatable being said about your husband, which ultimately must affect the family – how do you react? Do you feel any bitterness? Point of correction – it is not affecting my family, and can never affect my family in any way because I know my husband, I know who he believes, and I know who I believe. I don't have any doubt in my mind and I know that the good work the Lord has started in him, He will accomplish and complete, in Jesus' Name. So, you don't feel any bitterness when people write negative things about your husband? Not at all. I don't because I know him very well, and I know the God he serves. How does his ministry complement yours? I've said before that they are one. You can't actually separate them. People come around. They want to see the prophet. They want to spend time with him. But he hasn't got such time. You know, many of them want to bare their minds. You need to listen to them carefully. You need to be with them. So, I took up that. You've got it? They actually came for him but along the line, you find out that they want to spend more time with him. That's where I come in. How do you help your husband to overcome the gargantuan temptations that come his way every day, because this is a man exposed to thousands of people every day, especially women? How do you help him? You see, you don't have any alternatives in life. I can as well tell you that we don't have alternatives in life. Anything that is contrary to what we stand for or what God sent us for, is what we are going to fight against. I can say that God has been merciful enough, guiding and protecting us in that angle. You should know what you believe. Did you get that? As I said, you cannot afford to fail. There is no other way. So, you must guard against that. And that's what we've been doing. Could you tell us, in practical terms, how you've been guarding against that? The Bible says our heart is the communication point. If the fear of God is registered in your heart at any time, if you are doing evil, you must know. And so, you must guard that heart at all times. Anything that is contrary to the will of God, you shouldn't take part in it. Kenneth Hagin wrote in his book about how he fights the temptation of women. He said his office and his wife's office are next to each other, and he said he deliberately made it so. And that at every given time, the two doors are open so that the wife sees the person he is counselling and he also sees the person the wife is counselling, just to make sure he fights and defeats the tendencies of the flesh. Well, it is God that guides. It is God that protects. How long do you keep on watching over a man? I mean, as I've just told you, I can say that I know him (Prophet TB Joshua) very well, and I can tell what he is capable of doing. So, that's no problem at all. All right? I don't take any other measure than to pray for him. So, what counsel would you give to ministers' wives as to how they can help the ministry of their husbands, as to how they can protect and preserve their homes while serving God and humanity? The counsel is, be the woman that God has made you to be. Don't measure yourself by yourself and don't live by other people's standards. Rest in the place God has for you. Be a good mother to your children and a good wife to your husband, and a woman of faith to humanity. Whatever situation you face in life, God is saying something through it and about it. If your husband were to be in the secular world, he would be a superstar – because here is somebody who sits here, and presidents, top government officials and important people come from across the globe to see him. Do you have that feeling in you of having been married to a superstar? All we do here is just absolute grace of God. Everything that happens here is by the grace of God, and the joy of the Lord is our strength. So, we don't feel anything special because important people are coming. Rather, we appreciate the grace of God upon our lives, upon the church, and we give Him all the glory. So, there is no superstar feeling. If there is any superstar, that superstar is Jesus through whom we can do all things. So, I don't feel any different from who God says I am. My husband doesn't feel any different from who God says he is. 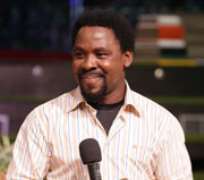 If this man were not Prophet TB Joshua, would you have married him? As I told you, apart from being a prophet, I actually saw what I needed in a man. So, it is not a question of being a prophet. It is about his character, his inner being. What kind of man did you pray to marry before you met him? Every woman desires to have a good husband, although appearance is deceptive. But God looks at the heart. I wanted a God-fearing man, an honest man and a kind-hearted man. And those are the qualities that I saw in him. Over the years, you've been to many places. What memories do you have of the places you've been to, whether in Nigeria or outside? Good memories. I've been to many places, you are right. After this, I still have something good to talk about them, about the people and what they receive from the Lord. We don't just to because we want to go. We actually visit places because God wants us to be there. And, when we leave there, there are good things to talk about. What's your greatest fear in life? I don't fear anything because I know God is there, and He can handle every situation. Embarrassing moments? Have I ever had any? So, it has all been smooth? There have been many challenges. I have said that. What are these challenges? You've not told us. You mean the wife of Prophet TB Joshua can have hard times too? A man sought after by presidents, kinds and ministers, by everybody?